When the Bush administration ran the Civil Rights Division at the Justice Department, career lawyers wanted to look into accusations that officials in one state had illegally intimidated blacks during a voter-fraud investigation. It used to be that the Civil Rights Division of the DOJ was interested in helping eligible American citizens exercise the franchise. Now the message is just “a shame”. 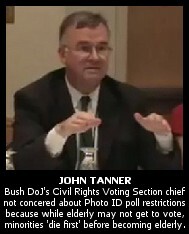 Incredibly, John Tanner Argues Restrictive Photo ID Laws at the Polls Actually Give Minorities a Greater Voice! Von Spakovsky — a fox to guard the chickens? Von Spakovsky should be in jail for his crimes against voting rights — I agree with Obama that this guy has done nothing to earn a 6-year appointment to the FEC. After turning the concepts of voting rights protection on its head while working in the Civil Rights Division of the DOJ and after being sneaked into his current position via a “recess appointment”, the Senate Dems should show some spine and send him back to whatever rock he crawled out from under. Note what Barack Obama has to say about why he is putting a Senate “hold” on this appointment. More than 40 years ago, John Lewis and Hosea Williams, along with hundreds of everyday Americans, left their homes and churches to brave the blows of Billy clubs and join a march for freedom across the Edmund Pettus Bridge. Thousands of anonymous foot soldiers – Blacks and Whites, the young and the elderly – summoned the courage to march for justice and demand freedom. A few months later, the Voting Rights Act was signed into law. It’s because of the sacrifice of these American heroes that we’ve come so far today. But there’s more work to be done. Recent elections have shown unprecedented intimidation of African-American, Native American, low income and elderly voters at the polls. We’ve seen political operatives purge voters from registration rolls for no legitimate reason, distribute polling equipment unevenly, and deceive voters about the time, location and rules of elections.